I am realizing that if I want to do this right, I will have to "make the time" for what I really want to do. I am definitely not a journaler, and I have a 'learning difference' that makes it difficult for me to get what is in my head down on paper...or in the case of this blog...on the computer screen. But I will have to JUST DO IT! as the saying goes. I quit my job to be available to my kids...being a grandma...and that is what I am doing. It gives me lots less hours in the day to do other things, but it is oh, so rewarding. I love my little ones...Owen and Eden, Emerson, and Danika and Maeilyn. They are little miracles! And the oldest just turned three...the youngest is three months old! Three came in just 4 months! I'm doing a sampler quilt class/club right now. The quilt has 9 large squares, all different. We had a choice of three different color themes: Christmas, rose/green, or a black/red tulip design. I chose the last one...and am having fun with it! It is TOTALLY out of my comfort zone for colors. I'll post some pictures of my squares in a couple of days (hopefully)! I made a collection of cards this morning. I have decided I prefer the clean and simple style. I like looking at the complex ones, and I make a lot of them, but I think I like the simple look better. My hubby does, for sure! Here are some of them. I apologize for the dark pics...will use a bit more light next time. This card has no layers! The stamp set is Time Well Spent, from Stampin' Up. Stamped with Basic Black and colored with watercolor pencils and an aquapainter. It is for SCS Inspiration Challenge #68. This is one of the graduation cards that I made for all the guy grads at church. The girls got the Swiss dots CB folder instead. Simple, but elegant. The stamp is from Hero Arts, and the mortarboard is from a package I got in the scrapbooking section at WalMart. Both cards are great! 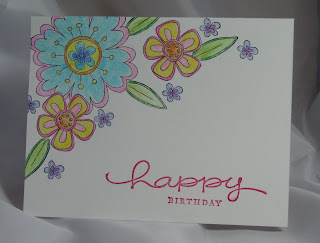 I love the way you stamped the flowers on the edge of the birthday card. The graduation card is very elegant! Congrats on being able to stay home! Great cards - I love the one layer colors and the grad card is perfect when you have to make more than one! Your blog header is really cool too! 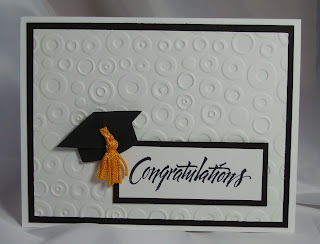 I love this graduation card - so simple and very striking! All of your pictures are like eye-candy - you've got your paper creations, your lovely quilting squares, and your colorful studio pics. I'm inspired and running for my craft table . . . Very pretty. I like the proportions and simplicity of thss card. Good job.